Teenage star Bella Thorne wowed with her chic look at the LA premiere of The Mortal Instruments: City of Bones movie held at the ArcLight Cinemas Cinerama Dome in Hollywood. Bella’s hair was done in a side plait on one side of the head. The other side featured a loose bunch of strands which framed her face. The entire effect was playful, fun and flirty. 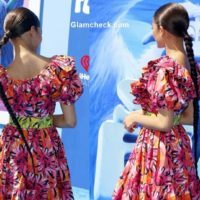 The young lady seems to be a fan of this style and we have spotted something similar when she sported a side fishtail plait with loose hair around the face at another event. This hairstyle is quite an easy style to do yourself. All you need to do is make gather your hair loosely at the side of your neck and make a regular plait. Secure with hair elastic. Take a thin strand of hair from below and wrap it around the hair elastic and tuck in it discreetly. If you do not have wavy hair then you can wrap the open part below the hair elastic around a curling iron for 15 seconds. Pull out a thick section of hair, from the side which doesn’t have the plait, on the front-side area of the head. this will give the carefree and messy look. Her face looked luminous, which defied the popular notion that girls at this age are usually riddled with some or the other skin related problem like pimples or acne. Of course, a lot of the luminosity can also be credited to the smooth makeup that she sported – especially the pink blush on the apples of the cheek combined with the cream highlighting blush. Fake eyelashes made her peepers look huge. The bubblegum pink lip shade gelled perfectly with the rest of her makeup. Clothes: The sheath style short dress was from Alexander McQueen. The sleeveless chenille outfit was black and white in color. It featured stained glass print. The actress played smart by choosing to wear a totally age appropriate dress for the occasion. Accessories: Ms Thorne paired Christian Louboutin strappy sandals with her attire. The tricolored footwear featured shades like tan, black and white and had chunky heels. The black hoop earrings that the teenager wore were in tandem with the school girl look. The actress also had a dainty Cartier gold bracelet on her wrist. 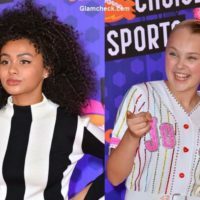 Glamcheck’sVerdict: The actress looked pretty and stylish. She carried her look well and one wouldn’t believe that she is only all of 15.